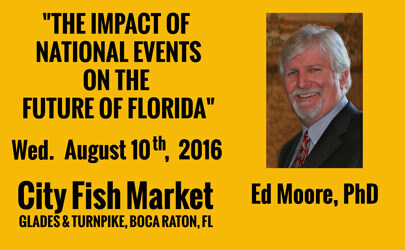 Edwin H. Moore, Ph.D., has been the President of the Independent Colleges and Universities of Florida, a Tallahassee based association of 30 private, not for profit colleges and universities since 2003. He also serves as the Executive Director of the Higher Education Facilities Finance Authority in Florida and as Chief Executive Officer of the Florida Independent College Fund, a non-profit organization. Ed has a unique portfolio, having served during his career in challenging roles in government, the private sector and in the not for profit association sector. Prior to his current roles at ICUF he served as Staff Director for the Florida House of Representatives Policy Committee while concurrently serving as Staff Director of the Select Committee on Medical Liability Insurance, the Select Committee on Worker’s Compensation and the House Public Security Coordinating Committee. He also served as the House point staff person for disaster preparedness, continuing operations planning (COOP) and continuity of government (COG) planning. He began his professional career working for the Florida House of Representatives as a legislative assistant and as a committee staff analyst, after which he worked for the Comptroller of Florida, as Executive Director of the Broward County Community Mental Health Board and then was a partner in national consulting firm in Illinois, focusing on large project developments and electric, water and gas utility consulting for over two decades, before returning back to Florida in 1999, where he served as President and CEO of the James Madison Institute. He then returned to the Florida House of Representatives staff in 2002 to serve as Policy Staff Director prior to being chosen as President of ICUF. He has been married to Kathleen for 41 years and has four children, Cason, Allison, Ashley and Brady, one granddaughter, Arlington and a grandson Hunter. While in Illinois he also served that state in various capacities, serving as a member of the Illinois Board of Higher Education, the Governor’s Privatization Council and the Illinois K-20 Joint Education Board. Ed has a Ph.D. in Public Administration and Policy with an emphasis on creating learning organizations in policy making settings. He is the author of numerous tracts on higher education, K-20 education, economic development, insurance, healthcare, and other public policy issues and has served in a consulting role for the International Republican Institute, the British Government and the US Department of State. Ed is a Fulbright Program Scholar and was awarded a Fulbright grant by the Department of State for study in the Republic of China, Taiwan. He wrote The Speakers Volume II, a history of the Speakers of the Florida House of Representatives. He was editor and co-author of a book for the Department of State for use in the Balkans titled “The Power of Ideas” for use by NGO and political party organizations. He is currently working on a book on the crisis in American education. He is a member of the CareerSource Florida Inc. board of directors and a member of the Enterprise Florida Stakeholder Advisory Council. He was an ex officio member of The Florida Council of 100 and is a member of the Florida Higher Education Coordinating Council. Ed has also guested on multiple Florida and national radio and television news, including locally regular appearances on The Usual Suspects and on WFLAFM in Tallahassee. He has received many awards and recognitions but is most proud of being named a Distinguished Alumni from Broward College as well as being named to the Broward Education Foundations Hall of Fame for graduates of Broward County schools. He was also named one of the 100 Irish-Americans in Education by the Irish government in 2012 and as a Distinguished Alumni of the Florida State University College of Social Sciences and Public Policy.